**Disclaimer – this blog post was mentally crafted during a cyclo-cross sprint training session, so excuse its seeming edgy-aggressive tone. So last year at this time I was in the throes of a torn MCL, ACL and meniscus – the result of a series of events – a couple of encounters with enthusiastic dogs, and the final blow coming at US National Mountain Bike Marathon Champs. But honestly, the best thing these docs did for me, is underestimate me. As a result, I decided I was not quite ready to throw up the white flag and curl up in my coffin, and signed-up for surgery with a surgeon who understood and respected my lifestyle. I mentally had this strange peace with the entire episode – injury and prospect of surgery, the journey back, and all that entailed. I saw this six-month hiatus as an opportunity to push my body’s mental and physical reset button. I also, in a very positive way welcomed this opportunity to rehab, and return to sport as a way to emotionally and physically live every minute detail, that I train and work with others to accomplish. And finally – I saw it as a challenge to return stronger than I had left sport, by placing a more purposeful emphasis on stability and mobility, basically the only things I could do for the first couple months. Athletes that I coach will tell you, they get sick and tired of me continually emphasizing that the off-endurance work of hip activation, hip-trunk stability and global mobility takes equal billing to the sport-specific endurance work. But I am a sincere believer, because I have experienced the benefits of this consistent investment in my own athletic life. I took this rehab opportunity as a focused period to develop and improve every little functional stability and mobility fiber of my body. I knew that if I set this foundation in place – when the time came to hop back on my bike, and start running again it would translate in to improved efficiency of power in to the pedals and foot strike, and act as my safety net to help avoid over-use as well as traumatic injuries. Nearly a year to the date of my decisive injury last year, I lined up for US National Mountain Bike XC Champs, and finished what I started, to take the victory. And like with all of our endeavors – the riches and lasting benefit was not on that particular day, but all that I had experienced, learned and gained along the way. So it goes, seeming set-backs can be turned in to invaluable opportunities. I am new to the RENO WHEELWOMEN cycling race team. I am not a racer and was hesitant to join Reno Wheelwomen until I met Lucie Oren, (Reno Wheelwomen Cat 4), an avid woman cyclist racer and enthusiast. Her enthusiasm for joining the team was the catalyst I was looking for to become a better cyclist. That day I signed up. I was excited to start, racing the weekly Wheelmen B races. I tried to not get discouraged with interruptions in training plans/rides. As life happens, what I wanted to do and what was needed to be done often conflicts. I changed the bike training to training for life and any proactive step or pedal would be a success for me which would empower and offer self-motivation to just keep pedaling positive. I took this roadblock in bike training as the perfect opportunity to practice using the power of the mind and positive perspective in order to not get discouraged when I can only cycle half the time I planned or cannot get any hill repeats in my day. Julie Young also encouraged the attitude that something done well is better than nothing. It becomes a mind game within yourself. If you perceive a change in training plan as a defeat then you cannot practice the mind training to persevere and push the limits during the last stage in a bike race. If you live with a defeated attitude it may train the mind to not push hard the last 30 seconds to the top of the hill on the fifth hill repeat or sprint past other racers across the finish line in a crit. By adopting any amount of training (No matter how little or how much you cycle) as an accomplishment then each day you are a winner in your mind. That positive attitude can be empowering and offer an opportunity to practice a winning attitude which will lead to increased mental edge in any race. I believe mental toughness is as important in life training as physical training. That is why I love my bike and all the life training it offers both my body and mind. Nothing feels better than when you do not want to get out and pedal and persevere and push through the inertia to once again breathe hard, work hard, sweat and of course smile at another day of defeating life’s road blocks. I hope that more women adapt a proactive, positive, attitude and JUST PEDAL!!! Do not let race intimidate you from trying out a women’s cycling team. The group rides are great fun and educational too. There are avid, serious racers on the teams but often there is also a variety of levels of racers/ riders. This season, I chose to spend some time working on my time trial racing with the goal of participating in this year’s NCNCA District Championships and, hopefully, the USAC Masters National Championships. I’m primarily a short-distance criterium racer who does best when I can draft off of other people. Then, when the time is right, I try to sprint to the finish line. It’s crafty, but it’s a tactic that has worked well over the years. But, like everyone, the time comes to try something different. Time trial racing, solo against the clock, seemed like a good addition to my repertoire with the goal of adding some straight-up speed. After careful discussion with Coach Julie Young last year, we decided it was the best way to shake things up a bit. The NCNCA District Time Trial race is 40 kilometers (24.8 miles) and it’s all flat. There’s no place to hide on this thing. That meant an increased emphasis on fitness, as well as dialing in the bike fit to maximize my ability to generate power. 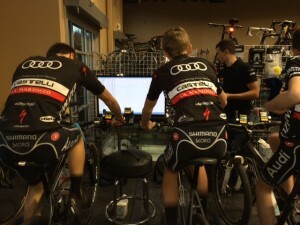 So, with the killer, aerodynamic bike and fancy wheels procured, we did the Professional Bike Fit at Silver Sage Sports and Fitness Lab and put the training plan in place. While it’s not the Race Across America (RAAM), it was definitely the “vast unknown” for me, and my nerves were palpable even months before the race took place. There was a point where I wasn’t sure I was going to even do the race. I went through a period where I wasn’t feeling up to the challenge of getting outside my comfort zone for a variety of reasons – personal stress, some discomfort on the bike, and lack of confidence. It’s amazing how, despite a few years of racing experience, I can get so wrapped up in things and bring myself down. After one of several check-ins with Julie, she helped me get through the pre-race angst with clear explanations about how to train and race a time trial, careful planning of the workouts, extra focus on the bike fit, and lending her own experiences to my situation. Having a coach who has “walked the talk” as an athlete is invaluable. When that coach is so good at putting it all into words… it’s amazing how much it helps clear out the mental clutter. Long story short, Julie’s guidance helped me meet or exceed my goals for speed and power for the race, and I placed third in my group with some pretty stiff competition. There were plenty of women who were faster than I was, but it’s a big boost to have done better than I thought I could. Now I know what it takes to race a longer time trial and I took away some valuable information about how I can improve my performance for the next race. Racing is definitely a mental game as much as a physical one. Coach Julie and I have already put the plan in place to fine tune things for Masters National Championships in September, so I can focus on the experience of racing and not on all the distractions. Should be a fun event! Thresholds and power are always discussed when training in cycling. When you talk about thresholds you are talking about power, and that power is measured in watts. Your Functional Threshold Power, or FTP, is how many watts you can hold for an hour. Your weight plays a role in your FTP, as well. Theoretically, if you weigh 150 pounds and have an FTP of 250, and you’re racing against a person that weighs 250 pounds with the same FTP, you will be faster. This is known as your “power to weight ratio” or “watts per kilo”. 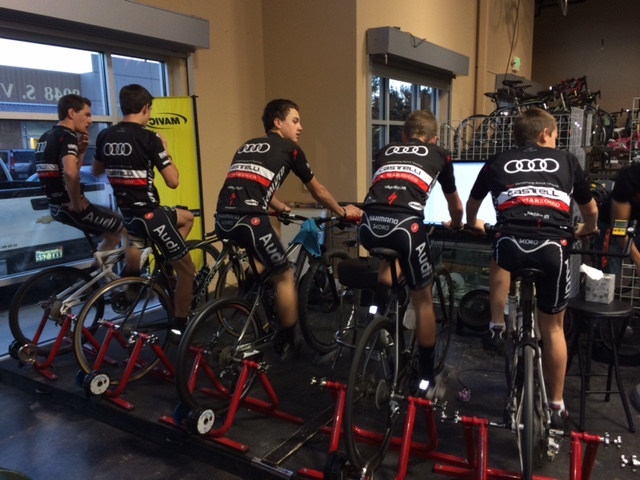 At the beginning of this season Reno-Tahoe Junior Cycling started taking what’s known as FTP tests. These tests measure exactly how much power you can withstand for an hour and the results we got were quite surprising. Before the tests, we all asked our coach, Trevor DeRuise, what power would be suitable to shoot for. We got a straightforward answer of 220 watts. This would be enough to be competitive in Cat 1 races but not anywhere near winning and for only having 2 years of structured training, that was a reasonable goal. When the test started we all realized how much speed and strength we had actually gained during those short 2 years. Almost everyone on the team was hitting numbers way higher than 220 making it clear that we were definitely ready to start racing more competitively and higher categories. After the first FTP test, the average FTPs for our team was between 230-240. This was the beginning of the season though and work had to be done. We continued our normal structured training and were promised that over time this would raise our FTPs. With races becoming more competitive and sometimes shorter distances, power output is viewed as very important from our team. After another month of training, we took our second FTP test and the numbers were surprising. Everyone had moved up, and not just by a little bit. Every rider on the team had increased by over 10 watts. Some had even moved up 20 watts after just one month. This proved to us that the only way to increase fitness is to have a plan and work hard. 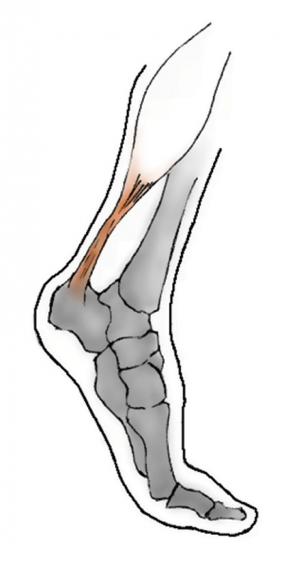 The worst non-lethal injury known to the long distance runner, the despoiler of the best laid exercise plan, is a rupture of the thick white cable extending from calf to heel, known as the Achilles tendon. Runners can exert upwards of 16,000 pounds per square inch on the Achilles, but it only takes 14,500 PSI for an Achilles to snap, and much less to cause tendonitis, according to a 2008 study; thus, the Achilles is arguably the most vulnerable connective tissue in the runner’s body. I knew this, of course—every runner does—but perhaps lulled by feel-good hormones coursing through my brain every time I ran, I ignored those telltale catches in my gait, and was only jerked out of denial when my right heel locked up and a robin’s egg-sized lump protruded from the sheath. When it did, I realized I had not only bollixed my chance for athletic glory, but also dropped the ball on a mid-life makeover, an attempt to prolong the life of a middle-aged man whose family crest bore a garland of clogged arteries surrounding a tureen of Hollandaise sauce. How could this setback—in my case, the dreaded Achilles tendonitis—happen now, in the midst of a return to former svelte athletic prowess? I considered blaming my doctor, the preternaturally agreeable Andy Pasternak; my partner, the insightful and optimistic Jane Grossman; my coach, the wise and compassionate Julie Young. All were above reproach. It was nobody’s fault but mine. Indeed, Young designed the perfect exercise program, which, if I had followed it, would have saved me money, pain, shame and this very public apologia regarding my failure to complete what would have been a glorious thing indeed: an autumnal circumnavigation by foot, cycle and paddle of the inland sea to which this publication owes its name. I embarked on a Fitness 5.2 project at the beginning of 2014 and I had begged Pasternak and Young’s help. Why? The problem, as I saw it, was I was flirting with death. I sat too much. My family tree looked more like a shrub when it came to my male progenitors; none lived long enough to collect Medicare. My father died at 44. Paternal forefathers passed in their early 60s. My younger brother endured quadruple bypass surgery in his early 40s. Not an auspicious gene pool. Somehow dodging a bullet thus far, but not wanting to drop dead in the middle of a whimsical run around the local trail system, I figured I needed more than a standup desk to nudge me past 75, the average life expectancy of a Caucasian U.S. male. Not only would I have my comeback, I’d gild the effort with the circumnavigation of The Lake. “Sure, we can help you out,” said Pasternak when I asked about the sports fitness side of his practice. So he and Young, who is the director of Silver Sage Sports and Fitness Lab, took me by my atrophying arms and thickening midriff and led me into an adjoining room. Pasternak produced both tape measure and calipers, and pinched and prodded both my muffin top and the fleshy spheroids I once called my chest, and produced metrics proving I was in as crapulous a state as I thought. Young designed an exercise plan to whittle me from flabulous into a lean fighting tiger by revivifying a heart muscle that needed more stimulation than it was getting scribbling essays for school and work. “I mainly want to experience that wonderful feeling from the old days, of moving like a kind of machine for miles,” I wrote Young a week before she devised the plan. The machine, I knew, long since surpassed its warranty, but I aspired to longevity, and indeed, greatness, nonetheless. 1) weak of hip; 2) soft of core; 3) limber as a 5-foot-9-inch length of number 18 rebar. She used a goniometer to fit me to my road bike, and she used Dartfish video to help straighten my running gait. Young is a retired cycling goddess, one of this country’s best international riders of the 1990s, and she still stomps in regional endurance races. A full-time coach for the past 12 years, she’s known to be firm but flexible, as interested in mind as body. As I knelt on the floor of Pasternak’s office one day, an outsize rubber band looped around my knees, performing a dog-like move called the Fire Hydrant, I had plenty of time to admire Young’s own shapely and well-muscled gams; compared to hers, mine resembled those of a Modern Game fowl. At first I carefully followed Young’s training regime, which appeared each evening in my inbox and consisted mainly of road and mountain bike riding and running, and a series of exercises meant to strengthen my core and hips. These floor routines seemed to be quaint “nice to haves,” not “need to haves,” so time-constrained as I was, I ignored them. Here’s where the soundtrack to the film version of this story shifts from major to minor key, but I’ve already made clear where this narrative is heading. Regardless, I knew my body responded well to training loads. I told her to bring it on, and before long I was heading out the door almost every day. I hadn’t run regularly in a few years, so Young mapped slow and steady 45-minute trail runs in 3-2 intervals; three minutes walking and two minutes running. Within a few weeks we increased those sessions to an hour. “OK, Julie! I will,” I said, trying to match her buoyancy, imbued with the best of intentions and a desire to make her proud. But every few weeks when Young and I checked in, I’d have to admit that I hadn’t. I also played catch-up on Saturdays and Sundays, going longer to make up for missed workouts during the week. “Just take it easy,” said Young, advising me to stick with the day-to-day program. “We’re going for lifetime wellness here.” But those long days felt good, and the running felt better than the cycling, liberating even, bereft of the flashy kit and spare tubes and helmet and the company of amateurs who fretted about their body weight like Georgia debutantes. Running was so utterly stripped to its core, a sandblaster for the soul, and I wanted to revisit the 90-mile weeks I enjoyed in my youth. I watched On the Edge, a film from the last century about an over-the-hill and once-disgraced distance runner played by Bruce Dern who returns to his home in Sausalito to race the Cielo-Sea, a fictionalized version of the Dipsea. The runner, Wes Holman, persuades his old coach to help him win the race. “I’m gonna take your bloated carcass and teach you how to become a mountain racer,” the coach, Elmo, played by John Marley, tells him. Running made my body hurt so good, and the miles indeed cleaved the jigglies from my torso. Of course, well before my fall from my athletic state of grace, I started thinking about jettisoning bike and boat and circumambulating The Lake via the Tahoe Rim Trail. I figured I’d don a Go-Pro, drum up sponsors and wear their patches, tweet and Facebook my progress from the field. So I happily practiced by downing Nature’s Bakery’s fig bars and Clif Shots as I sidestepped Young’s recipe and upped my hour-long runs to nearly three. And that’s when the damnable arrow, the runner’s bane, found my Achilles. I called Andy Pasternak’s South Reno medical office in a state of near panic. I was several weeks away from driving to Vermont for a gig at a climbing magazine, and I needed a remedy ASAP. I was referred to a physical therapist whose ministrations included wretch-inducing cross-fiber massage and electro-stimulation, the latter of which made my toes twitch like a machine-gunned mobster—and this at $200 a throw. Those nostrums did nothing to repair the tendon in the short term. The therapist recommended I curb my athletic ambitions. She diagnosed weak hips, and prescribed the same floor routines Young wrote into the plan, which she had insisted were critical to my middle-aged fitness. I felt wretched and guilty as I drove across the country with an Achilles aching each time I depressed the gas pedal. When I reached my editorial residency in the Green Mountains, I admitted to Young what I did, and braced myself. But instead of shaming me with invective and giving me the boot, she rolled with it. “Brad, what we’re doing here is laying the foundation for a lifetime of fitness,” she said, and she calmly recalibrated the plan. So rather than run roughshod on the Long Trail over Mt. Mansfield, I noodled my road bike between the Upper and Lower Pleasant Valley roads, drove to Mt. Washington to climb its moderate Henderson Ridge and slowly roller skied past verdant fields of happy heifers whose milk would go into Ben and Jerry’s Chunky Monkey. As I began putting less pressure on myself, and experienced more joy in the workouts I performed pain-free, I realized my tendon-sprung project hadn’t much altered the warming climate or slowed the universe’s rate of expansion. Even Jane said she still loved me. My ankle pained me, but truthfully, all was well with the world. In a way, my strained Achilles was a signifier of ambition, of overshoot. I didn’t need to run around The Lake or train like an athlete to live a longer life; all I really had to do was move my body. It occurs to me that this story of my inflamed Achilles is neither apologia nor elegy as much as it is an ode to wellness. Fitness really is about the journey; the destination, after all, we already know. Now, Jane reminds me that it’s time to hike Galena’s trails. And so I go. This article originally appeared in Tahoe Quarterly, Best of Tahoe 2015/May 2015. Reprinted with permission. Contributing editor Brad Rassler is a Reno-based writer whose stories have appeared in Alpinist and Ascent. Find more of his work at www.sustainableplay.com. You have the best of intentions: You’re signed up to run a 10-miler. But many beginning runners find themselves overwhelmed as to how, and where to start training, as they gear up for the big race. Every runner, new or experienced, needs to prepare themselves mentally and physically for the specific event’s demands. The key to tackling the challenge of improving your running performance is first and foremost to stay injury-free. Just getting out there and running doesn’t work for many people, especially if you’ve been away from exercise for any period of time. So the first step: Find a beginning running plan to follow. There are beginning running programs online, or an even better option may be to find a running coach to help you develop a comprehensive, gradually progressed training plan. There should be a clear objective to each and every training session, as well as an understanding of how that relates to the goal — in this case, a 10-miler. Empowered with this understanding, you can train more purposefully, which equates to more effective training and successful results. Individualize your training and make it relative to your individual circumstances: A training plan needs to be based on your current fitness/past training and goals, and then gradually progressed as you adapt (very individual) to the training. Toe the start line mentally and physically fit, injury free and hungry for action: The key to improving fitness and avoiding injury is a gradually progressed training plan. Focus on consistent hip and trunk stability, and general mobility. Cycling, swimming and hiking are good supplemental cross-endurance training tools that will provide mental and physical variety. Once a solid endurance base is in place, systematically and consistently include speed and higher tempo workouts in your training plan. Gradually build up your endurance toward the 10 mile distance. Train at the intensity you hope to hold during the event. Simulate the event’s terrain in your training – uphills, downhills and flats all present different challenges. Believe it or not, chocolate milk tops the list for post-run recovery drinks. Dial in your race-day nutrition during your preparation, not the week or day before. Build your bank account of sleep leading into the race. Ultimately, the key to successful training is individualizing the plan to efficiently and consistently fit all the training components into life’s priorities of family and work. Individually developed plans also consider how each individual adapts to the training load — to ensure adequate rest to counter-balance the work — resulting in a progressively upward performance trajectory. Whether you’re looking to complete your first Reno 10-Miler or you want to set your own personal record, Silver Sage Sports and Fitness Lab helps people at all levels of ability. If you have questions about any of these workouts or are just looking for advice, email us at jyoung@o2fitness.net. The key to improving running performance is first and foremost staying injury-free. In our experience, runners can insure against injury by investing in consistent purposeful hip and trunk stability exercises, global mobility (joints, muscle length, soft tissues), quality work and quality rest, and a gradually progressed training program. Here are a few key components of a 10-mile training program, assuming you already have a solid endurance training base in place. Training the ability to hold a stable, neutral pelvis and spine and efficiently generate the power from the hips in to the lower extremities) x two-three days/week. Hip activation (to improve hip recruitment in the running stride) x three days/week as a warm-up protocol. Speed and power sessions; for example, a track workout with 3 sets (5×200 meter on/200m easy). The “on” is performed at 80% ramping toward 100%. The objective is to institute solid, efficient mechanics, as well as to gain running-specific strength and power. We need to get fit to run, not run to get fit. We start these at a more moderate intensity to ensure that purposeful, controlled mechanics are in place. Once established, increase the speed, power and intensity. The goal is not how fast we can run at the expense of technique, but how well we can maintain solid, controlled movement under higher intensity. This workout, by controlling recovery time, also helps improve recovery rates. Interval sessions for the 10-miler may start with lactate/anaerobic threshold intervals and progress to V02 type intervals, depending on each individual’s race goals. Lactate threshold intervals train the body to more efficiently process the lactic build-up. Lactic acid is a by-product of burning carbohydrates. This easily metabolized fuel source is the energy of choice at higher intensities. As the intensity levels transitions along a spectrum from aerobic (with oxygen) to anaerobic (without oxygen), so does the fuel source from fats to carbohydrates. By consistently incorporating these intervals (and we suggest alternating them on flat terrain and as hill repeats), at the appropriate time during the week, you will run, with more metabolic efficiency at higher speeds. Supplement running with cross-endurance activities, such as swimming, cycling (road and mountain) and hiking. While we want to perform specific structured workouts while running to gain the greatest specific muscular and metabolic adaptations, using other forms of exercise to continue to develop and maintain a wide endurance base provides active recovery, mental and physical variety to avoid feeling obligated to running and injury prevention. Whether you’re looking to complete the Reno 10-Miler injury-free or you want to set your own personal record, Silver Sage Sports and Fitness Lab helps people at all levels of ability. If you have questions about any of these workouts or are just looking for advice, email us at jyoung@o2fitness.net.